Grazie mille to music blog Libro Musica for the post about “Color Line,” my latest release! The song is a co-write between myself and Woody Guthrie, who penned the lyrics back in 1950 in response to the blatant racism of his then-landlord, Fred Trump. The lyrics were unpublished until 2016, and upon reading them, I was struck (and dismayed) at the uncanny resemblance between the Trump Guthrie knew and our current President-elect. Click here to read the full article; click here to listen to “Color Line (Old Man Trump)”! You can stream the song online for free, but if you choose to purchase/download the song, please remember that ALL proceeds from sale of the digital track will be donated to the Woody & Marjorie Guthrie Fund at the Huntington’s Disease Society of America. 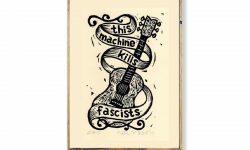 Woody Guthrie passed away from Huntington’s disease in 1967 and we are still working towards a cure for this fatal illness. 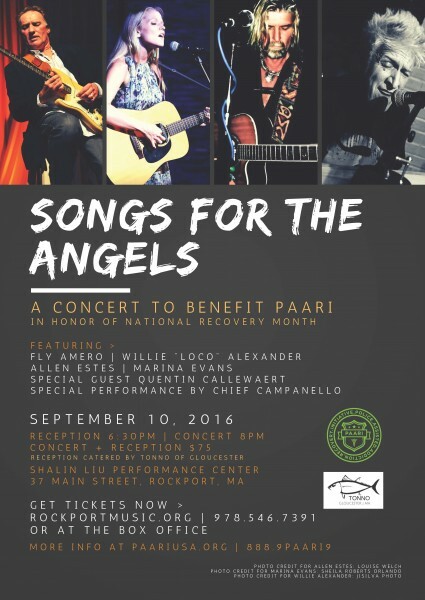 SONGS FOR THE ANGELS on September 10! During National Recovery Month, the Police Assisted Addiction & Recovery Initiative (PAARI) is hosting an exciting benefit concert featuring Cape Ann’s favorite singer/songwriters. Songs for the Angels will showcase Cape Ann’s vibrant music scene — represented by singer/songwriters Fly Amero, Allen Estes, Marina Evans, and Willie Alexander, and introducing opener Quentin Callewaert, plus a special performance from Chief Campanello, among other surprises. All will come together for the crucial cause of fighting addiction, both in our local community and across the nation. Held in the stunning Shalin Liu Performance Center in Rockport overlooking the Atlantic Ocean, this promises to be a one of a kind concert for a very important cause. You won’t want to miss this one! The concert will support the Police Assisted Addiction & Recovery Initiative (PAARI). In 2015, Gloucester, Massachusetts Police Chief Leonard Campanello and John Rosenthal developed a revolutionary new program aimed at getting opioid drug users the help they need, instead of putting them in handcuffs. PAARI’s mission is to support the Gloucester Police’s ANGEL initiative and to aid other police departments to implement similar programs. PAARI-committed police departments share a common mission: Encourage opioid drug users to seek recovery; Help distribute life saving opioid blocking drugs to prevent and treat overdoses; Connect addicts with treatment programs and facilities; and Provide resources to other police departments and communities that want to do more to fight the opioid addiction epidemic. In just over a year, PAARI has grown into a network of over 150 police departments across the country. PAARI works to remove the stigma associated with drug addiction, turning the conversation toward the disease of addiction rather than the crime of addiction. We work directly with over 200 treatment centers to secure fully-funded scholarships for participants with or without insurance. For more information about PAARI, please call PAARI at (888) 9-PAARI-9 or visit paariusa.org. This Wednesday, 12/16, I am excited to come together in song with fabulous performer & songwriter Fly Amero in support of Pathways for Children, a local nonprofit whose mission — to educate, empower, and support local children and their families — is vital to our community. Every year, Pathways partners with local businesses for its annual toy and book drive, and has distributed over 1,000 toys to local children & families enrolled in their programming. This drive is special because it is truly neighbors helping neighbors: all toys and books donated stay in our North Shore community! 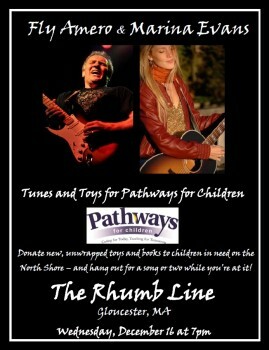 So please, join us this Wednesday at The Rhumb Line in Gloucester – come for the tunes, stay for the good cheer, and if you can, bring a new, unwrapped toy or book to donate!